Terminally ill? • Robber claimed to have cancer and only months left to live. Oklahoma City •In banks from Utah to Pennsylvania this summer, a middle-aged man with grayish, thinning hair, glasses and a blue polo shirt has been demanding money from frightened tellers and offering the same sad story: He only had months to live. After his fourth heist, this one in Utah, he earned a nickname, the "Bucket List Bandit," because the robberies were believed to be the actions of a desperate and dying man. On Friday, the FBI announced the suspect had been captured during a routine traffic stop Thursday night in the eastern Oklahoma city of Roland. Officers determined Michael Eugene Brewster, 54, of Pensacola, Fla., was driving a stolen SUV that he borrowed from a friend 10 days before the first robbery and that it had improper Utah license plates, said Rick Rains, a spokesman for the FBI's Oklahoma City office. "They determined the vehicle was reported stolen, and one thing led to another. Ultimately, they called us and we were able to determine who he was," Rains said. "It was a little bit of luck on our part." Rains would not say whether Brewster was armed. In the robberies, the suspect told tellers he had a weapon was armed but never showed one. Brewster appeared briefly Friday afternoon in U.S. Magistrate Court in Muskogee, shackled at his hands and feet and flanked by a pair of federal marshals. He acknowledged being the man sought by the FBI, and said only "Yes, ma'am" and "No, ma'am" when questioned by the judge. He was ordered held at the local jail pending court proceedings in Pennsylvania. Public defender Julia O'Connell said the process could take two months. According to the FBI, Brewster had crisscrossed the country since June, hitting banks in nine states and telling employees he had only months to live. In some instances, the suspect explained he was suffering from cancer. During Friday's hearing, Brewster coughed twice and chuckled once while talking to his lawyer, who declined comment on his health. Assistant U.S. Attorney Edward Snow said he wasn't aware of Brewster being terminally ill. It was only on Thursday that the FBI issued an arrest warrant for Brewster, saying a confidential informant gave the agency his name and birthdate following a Monday heist at a Huntington Bank branch in Erie, Pa. Surveillance video from a nearby carwash showed an SUV similar to the rental Brewster was accused of taking from an acquaintance in Pensacola on June 11. The first robbery occurred June 21 in Arvada, Colo., and by July 6, the suspect was believed to have robbed banks in Flagstaff, Ariz.; Pocatello, Idaho; and Roy, Utah  where he picked up his nickname after a teller told police that the robber passed her a note demanding money and said "I have four months to live." Following a two-week lull, robberies resumed in Winston-Salem, N.C., and within five weeks the Bucket List Bandit was being blamed for heists in Chattanooga, Tenn.; Bloomington, Ill.; Columbia and O'Fallon, Mo., the FBI said. About two weeks passed before Monday's robbery in Erie. A teller at the Erie bank picked Brewster's photo out of a lineup and authorities then reviewed surveillance video and found an "obvious likeness" to Brewster during the nine prior robberies. 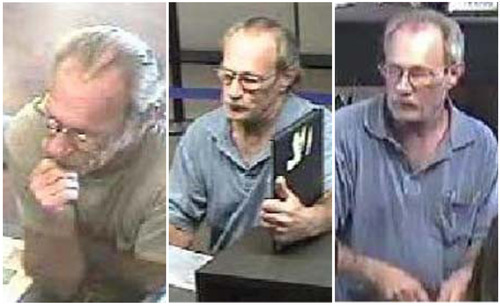 Photos from the various robberies show a man with grayish, thinning hair, generally combed or brushed backward, wearing glasses and what appears to be the same blue polo shirt with a front pocket. "We knew this was our person; we just didn't know who was going to be lucky enough to get a hold of him," said Bloomington Police Chief Randall McKinley, who said Brewster is suspected of robbing a PNC bank branch on Aug. 17 in the central Illinois college town. McKinley said it's not uncommon to have serial bank robberies in the same community or state, but it's rare to have them stretch over so many states. "To have them go all over the country is very interesting," he said. It wasn't clear why Brewster was traveling in Roland, just west of Fort Smith, Ark., and more than 1,000 miles from Erie. Investigators also hadn't determined whether Brewster is terminally ill, said Danny Hammon, a sergeant with the Roy, Utah, police department. The federal arrest warrant issued in Pennsylvania indicates that Brewster is wanted for allegedly borrowing but not returning his Florida acquaintance's black Chevy Captiva. The vehicle was similar to one described by witnesses at several of the robberies authorities think Brewster committed. No one was hurt in any of the robberies and officials declined to say how much money the suspect stole, except for the $4,080 taken from the Erie bank, which was disclosed in the FBI arrest warrant.